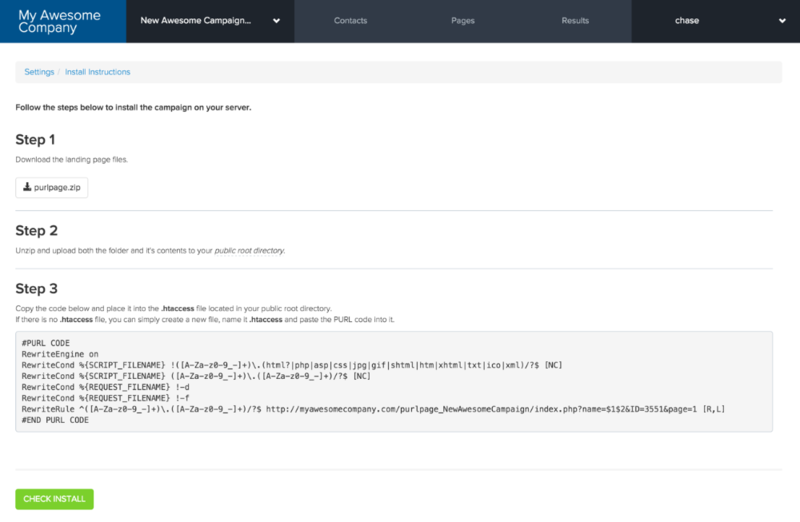 Follow the steps below if you would like to manually install your PURL campaign on your server. Select the New Campaign button from the campaigns drop-down. Under Use Your Domain, select Manual Install. Campaign Name: This can be anything that you would like. When completed, select to View Install Instructions. On the Install Instructions screen, follow the 3 steps provided to complete the install. Download the landing page files. Copy the code and place it into the .htaccess file located in your public root directory. If there is no .htaccess file, you can simply create a new file, name it .htaccess and paste the PURL code into it.